A December 2014 report from the University of Washington examines when and where climate change impacts will occur in the Puget Sound watershed. Sample map of “Year of Emergence”, depicting where and when there is projected to be noticeable differences in number of days per year with daily maximum temperature exceeding 90°F (32.2°C) compared to 1950-1999, for a moderate rate of climate change, high emissions scenario and high management sensitivity, according to the BCSD5 climate data source. Because natural and human systems tend to be somewhat adapted to historical climate fluctuations, ecological and societal disruptions may occur when climate change causes local conditions to deviate significantly from the past. A key input to deciding and prioritizing actions on climate change, therefore, is information about when and where the distinctive trend due to climate change is projected to emerge from the noise of natural climate variability. Although this information can be gleaned from existing climate change scenarios, it has not been explicitly characterized for variables and spatial scales relevant to local decision-making and most climate change projections are reported without contextual information about the significance of projected changes relative to variability in past conditions. Multiple local climate change projections, based on different emission scenarios, global climate models and downscaling methods, increase the difficulty of identifying when and where the effects of climate change could matter.As a result, despite the wealth of downscaled climate change projections for the PNW, potential users of this information still struggle with interpreting multiple scenarios, finding information about projected changes in environmental conditions of relevance to their particular management concerns, or simply the technical challenges of extracting relevant information from the massive datasets available from climate data providers. The Time of Emergence project enables a new look at future climate change from the point of view of when and where changes could matter compared to both typical variability in conditions and management sensitivity to those fluctuations. 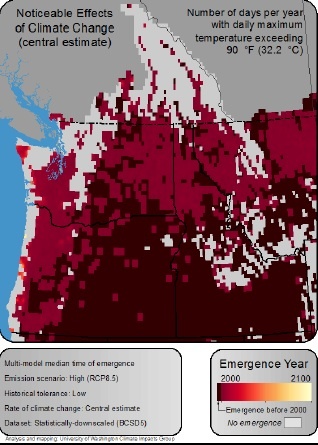 We combined climate statistics, engagement with policy and management entities, and data delivery platform development, to develop a new approach to climate change decision support based on the concept of “time of emergence” (ToE) for detectable change in management-relevant measures of the climate and environment for the US Puget Sound basin and Pacific Northwest (PNW). Variables for computation were selected in consultation with federal, state, and local decision-makers, who identified dozens of temperature-, precipitation-, hydrologic- and streamflow-related variables relevant to local management and operations, including proxies related to drought, energy, fish, floods, human health, infrastructure, streamflow, and water quality. ToE was computed for 35 types of variables (158 specific variables) using the “signal-threshold” method (Mauran 2013) and existing global, statistically- and dynamically-downscaled climate Project Report: Time of Emergence of Climate Change in the PNW iv model outputs from Coupled Model Intercomparison Project phases 5 and 3 (CMIP5 and CMIP3) and existing simulations of regional hydrological change using the Variable Infiltration Capacity model. Analyses were performed at the resolution of the input datasets (i.e., 1/8- and 1/16-degree for gridded data) and spatially aggregated for WA, OR and ID counties and for 4th-level (8-digit) hydrological unit codes (HUCs) in the PNW region. In addition to databases of ToE results, intermediary computational outputs, and a library of maps for visualization of spatial variability in signal emergence, a final product is a prototype open online system designed to support evaluations of relative climate risks and efforts to prioritize preparatory action. The prototype tool enables users to visualize and compare the time of emergence of significant change for different variables and PNW locations and to explore the sensitivity of results to reasonable alternative choices about potential future conditions and management sensitivity.Users can explore the sensitivity of projected ToE to (1) user tolerance for change (low and high management sensitivity to climate fluctuations, triggered by the 10% and 40% most extreme historical conditions, respectively), (2) climate modeling uncertainty (represented by high and low emission scenarios; an ensemble of up to 21 global climate models, depending on input dataset; and statistically- and dynamically-downscaled regional projections), and (3) uncertainty in estimating the climate change trend. The prototype online tool is designed to provide scientific and technical information about the underlying methods, assumptions, datasets, and appropriate interpretation and application of ToE results, as well as guided tours of how a user might use the tool to support climate change decisionmaking, and supports user extraction and downloading of visualization products and underlying data. The online tool is implemented in Drupal using the standard Drupal Content Management System, with custom modules to provide advanced filtering, user query, and dynamic visualization capabilities. The underlying database engine is MySQL, a standard open source database that powers both the underlying database for the Drupal site and a separate database that manages and serves the climate data. Designed as a prototype, the system can be expanded in the future to deliver additional ToE results (for different variables, input datasets, and/or user-selected analytical parameters), enhanced visualizations, or other features desired to enhance the user experience. In the ToE project, we have reduced the burden for regional practitioners to access and interpret climate change projections by (1) downloading and formattingdownscaled model output, (2) using these projections to compute locally-specific, managementrelevant variables, (3) evaluating the ToE for these variables under a range of plausible assumptions about future climate and management sensitivity to change, (4) developing syntheses of these results to indicate agreement across numerous global climate models, and for particular locations and levels of agreement, (5) producinga library of maps Project Report: Time of Emergence of Climate Change in the PNW v indicating spatial variability in both ToE and model agreement, and (6) developing a prototype online tool for exploring and accessing these results, in order to provide both novice and sophisticated users relatively easy entry into these complex and numerous datasets.By accurately representing the variability and uncertainty in projecting future climate, the prototype online tool enables user selection of the scenarios best fitting their decision context and risk tolerance. Combined with information about relevant response times, these results can be used to identify priority areas for more detailed analysis to support climate risk reduction. The flexible method of analysis, visualization and data delivery can be efficiently applied to new data sets as they emerge or are updated. Snover, A. & Salathe, E. (2014). Time of Emergence of Climate Change Signals in the Puget Sound Basin. University of Washington Project Report. pps 74.